It turns out that I look too tall and gangly on the Street Triple which doesn't do it justice in the images. The obvious result is that you see Shumi riding it for the shoot. However, read between the lines and you realise that this is a very compact, and resultantly light motorcycle  both highly desirable features in a sporty machine. Climb aboard and you're greeted by a roomy seating position that easily accommodates even my 6'1" frame. It gets better  the clutch pull is light, the mirrors are very useable and the turning radius is surprisingly small. Get used to the large tank and you soon forget that you're on a big motorcycle. Until you whack the throttle open that is. 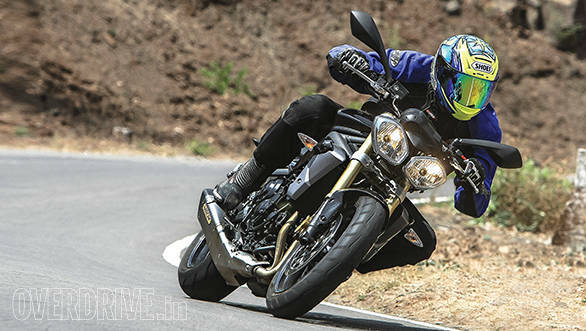 The Street Triple or Striple has been the darling of the international motorcycling world for a good few years thanks to its mix of performance, practicality and reasonable pricing. It's a concept that should work wonders for the Indian market. The styling is completely minimal and characterised by those brash bug-eyed headlamps upfront. They aren't pretty but they suit the bike's street fighter character perfectly. The tank has recesses that accommodate the rider's knees while the sculpted single seat is roomy and comfortable. Everything else is an exercise in minimalism. 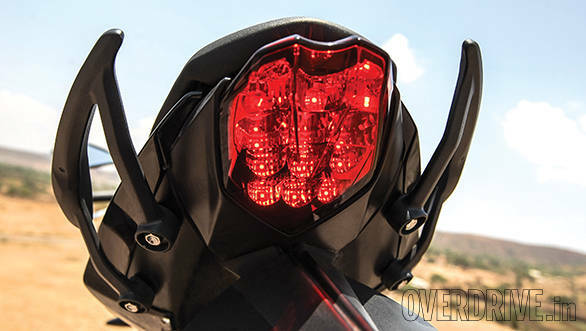 The end can is short and stubby  this bike is running a slip-on Arrow end can but the stock exhaust has similar dimensions. In an effort to get the mass as low and central as possible Triumph has placed the coolant reservoir under the bike. It may work wonders for the bike's agility but it's something to be wary of in India one sharp speed breaker and the ride can end in tears. Like the name suggests, the Street Triple runs a liquid cooled 12 valve three cylinder engine that displaces 675cc. Power stands just above the magical 100PS mark - 106PS at 11,850rpm. 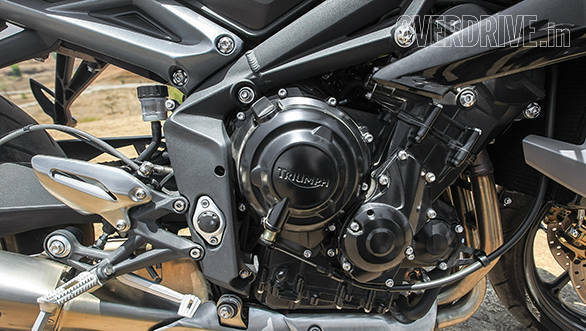 Three cylinder engines, which are a Triumph specialty, have the strong points of engines that lie on either side of the cylinder count range. They rev like inline fours, but produce strong torque like twin cylinders. Predictably, the Street's motor is a peach  it revs all the way to 12,500rpm but then I also repeatedly found myself in fifth gear at 30kmph in the city with the bike pulling comfortably. It's the combination of the strong 68Nm of torque and short gearing that makes such rideability possible. Three cylinder engines inherently produce vibrations but Triumph has got them down to an absolute minimum with just the occasional hint of a tingle through the bars. It's small enough to be insignificant. Right off idle the engine produces a strong, but very smooth and linear power curve. Low speed throttle response is super smooth and after a while we couldn't help but wish the bike had a bit of a rev band or a manic top end to spice things up. Not to say that it's a slow bike by any stretch of the imagination. First gear is good for over 100kmph and strong enough to lift the front clean off the ground. 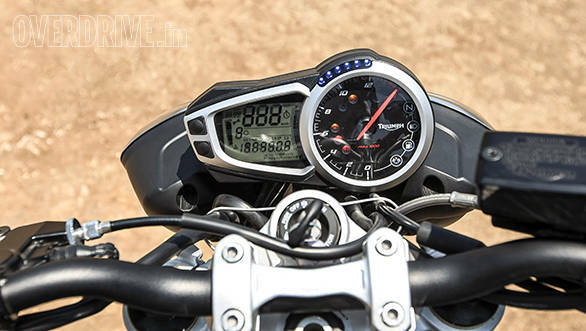 We don't have definitive figures yet but expect a 0-100kmph time around the 4s mark and a top speed well over 220kmph with the rider's ability to fend off the windblast being the limiting factor. The optional Arrow exhaust on this bike was certainly louder than stock. It's quite close to the wail of a traditional four cylinder, perhaps with more low revs whine that turns into a delicious howl as the revs rise. We're not sure what the stock exhaust sounds like but it should have a similar character, just more muted. The riding position, while sporty is still comfy. The pegs are rear set and high off the ground and you lean forward to the bars. The Street Triple, unlike its more advanced sibling, the Street Triple R runs unadjustable 41mm upside down Kayaba forks up front and a preload adjustable mono shock at the rear. The ride is a great surprise. The Street Triple has gracious low speed damping that effectively and substantially defangs bad roads. But once speeds rise, there's no descent into wallowing - the bike's control over its wheel movement and chassis attitude remains taut and sporty. Which means even on real, less than perfect mountain roads, you can go on pushing the pace instead of wondering when is a good time to back off. The bike feels agile and intuitive, eagerly following your inputs and even forgiving you when you make the occasional small line corrections. Twin 310mm Nissin discs provide stupendous stopping power while the rear gets a single Brembo 220m disc. All Street Triples in India get ABS as standard. After an entire day on the bike the only negatives we could come up with was that the switchgear was a little too small and doesn't feel very high quality, just okay. And that the rear mudguard could have been better built. Beyond those trivial issues the Street proved to be a properly involving and exciting machine that can handle almost everything you throw at it. Be it highway blasts or tearing up a canyon road or simply riding through a crowded gully in peak traffic, this bike will do it all. And it'll put a massive smile on your face in the process. Two months ago we said that the Rs 8.7 lakh (on road Pune ) Kawasaki Z800 is one of the best things to happen to Indian motorcycling enthusiasts. The Street Triple costs Rs 25,000 less and is a lighter and an even more involving machine. Triumph also has a range of finance options making it even easier to own one. Its lack of a fairing means it won't appeal to the typical 'superbike' lover. But for the enthusiast, someone who wants a real sports bike for realistic money, the Street Triple is an attainable dream that is completely worth saving up for. I know I am. *The Street Triple did feel special to ride but I do remember Shumi saying that the motorcycle felt a bit slow and lacking in punch for a 105PS motorcycle at the time. But while the new power figures do rob the motorcycle of some shine as far as my memories go, the fact is that at Rs 8.50 lakh on-road Pune, the Street Triple is no longer the deal we thought it would be. The Kawasaki makes just 7PS less for Rs 2.79 lakh less and the Kawasaki Z800 matches the price of the Street Triple roughly while offering a whopping 35PS more. In this situation, we believe there are far better deals you can spend your money on than this Triumph. By that logic the last two lines of the story are now void. This.